We often ignore the value of people who contribute their time in helping us prepare for Diwali and such people deserve love and care. With #SaareMaelDhoDaalo, Ghadi encouraged the audience to respect every profession. Following their older campaigns, Ghadi wants Indians to be more socially conscious and aware of the way we treat different professions. Mahindra Truck And Bus came up with a fresh idea for their Diwali commercial. With #GharKiLaxmi, the brand showcased a contemporary woman in her all new avatar. Through the video ad, Mahindra delivered the true essence of being a woman and the turnaround females can do if they believe in themselves. To deepen its connect across audiences, Nerolac launched a video ad that shows how our childhood memories are connected with Diwali and how Nerolac helps in recreating those old memories together. We are sure you will reminisce your childhood after watching this beautiful commercial. This Diwali, HP India got praised all over the internet by making a beautiful ad film that urges viewers to shop local and support street vendors. The ending of the video with “Support the street vendors, our lights brighten their homes too. #TuJashnBan Kisi ki Zindagi ka,” perfectly delivers the message HP India wanted to convey. Schmitten delivered the important message of gender equality in the correct manner through #AadhiAadhiDiwali. With the video ad, the chocolate brand tried raising awareness of Indians towards treating the family members of females as a part of their family. With #ComeHomeToCelebrations campaign, Legrand India shed light on the value of electricians in Diwali festival and gifted them time to celebrate with their families. As a part of this campaign, Legrand team visited houses of these unsung heroes and helped in Diwali preparations by decorating them with beautiful lights. As a part of #HarTyoharMeinBigBazaar campaign, the brand launched a video featuring train travelers. Disappointed after not reaching on time for Diwali, the passengers start celebrating the festival by offering sweets and decorating the train. 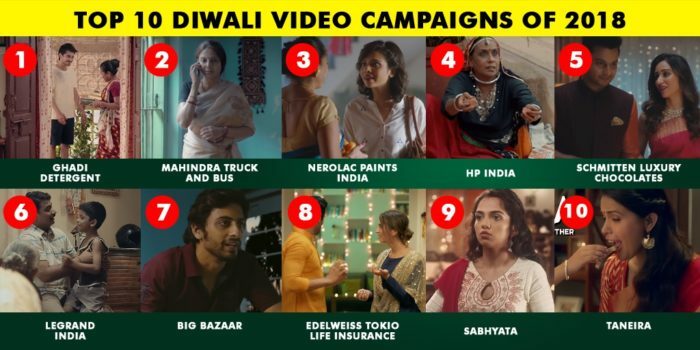 With their Diwali video advertisement, Edelweiss Tokio Life Insurance tried creating awareness about the right way to invite Laxmiji for Diwali. Edelweiss showcased how financial security is the best way to prepare for Diwali and how their Wealth Plus plan contributes in doing so. Sabhyata dared to break gender stereotypes in India beautifully with the Diwali ad. At a time when the #MeeToo movement is making a change in India, this video gives the message of gender equality in the correct way. This Diwali, Taneira went a bit different and expressed how every woman is unique yet relatable just like every Taneira product. As a part of ‘Like No Other’ campaign, 2 films were launched that display a refreshing take on how the protagonist is rooted in tradition yet gives her own unique twist to it, making it contemporary & personalised. Which one did you like the most? Do let us know in the comments section.